Want to create your own Valentine’s Card? Here’s a Japanese Origami Paper-inspired one..
1. 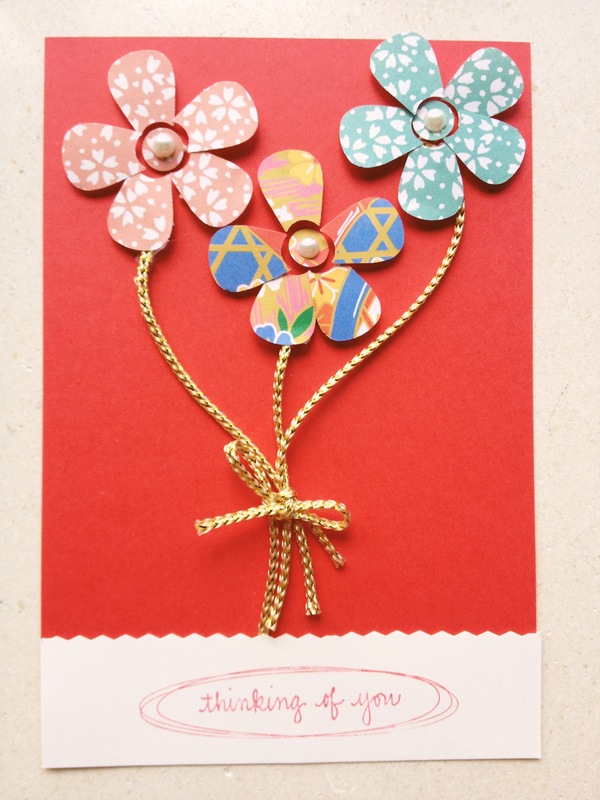 Punch out flowers from your Origami paper using your decorative hole punch. 2. 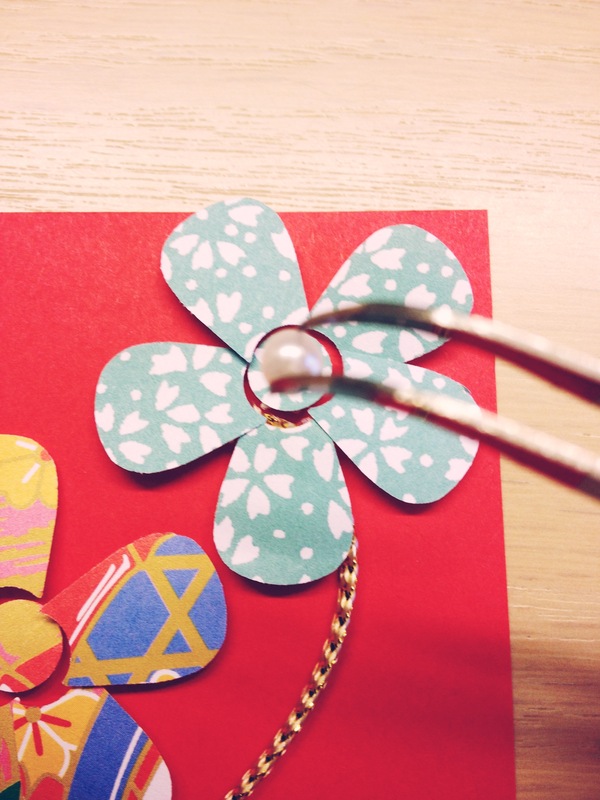 Position the flower petals onto your paper the way you would like them to appear. 4. Next, your gold ball of string will act as the stem to your flower. Depending on the size of your card, cut 3 pieces of appropriate length string so that you leave an inch from the bottom of the card for your message. 5. Glue one end of the gold string to each of your flowers and leave the other end open. Tie the open ends of the strings with another piece of gold string to create a bouquet effect. 6. If you want to add extra embellishments to your flower, then glue the additional pearl beads to the center of your flower using your tweezers. 7. Cut a strip of paper the width of your card stock and one inch in height to place your message. 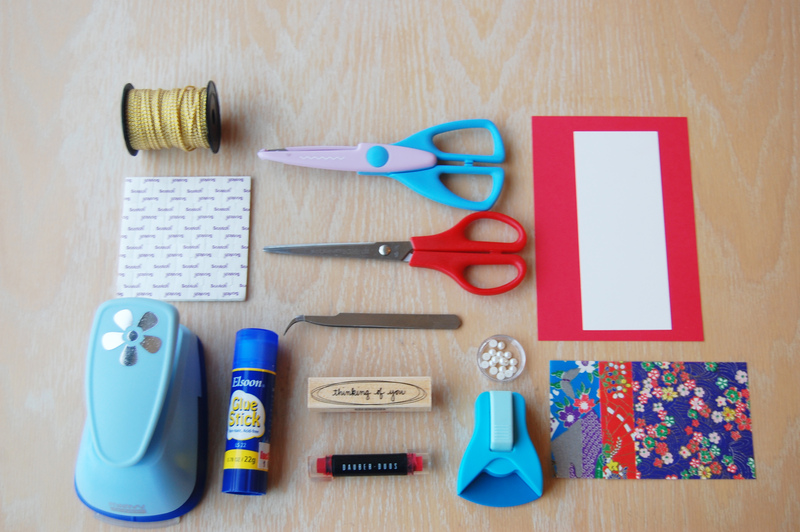 You can use your decorative scissors to give the paper edge a cute rippled effect. 8. Stamp your message onto the strip and let dry for 15 minutes. 9. Using your corner punch, punch all 4 edges of your card to give it a finished look. 10. And there you have it.. your personalized Valentine’s Day Card. Tags: D.I.Y., Gift Ideas, Valentine's. Bookmark the permalink. Previous post ← Spreading The Love This Valentine’s Day! Thanks Steph! Hope to see more of your creative and fun work too! Thanks Steph – love crafting! Hope to see some of your cute work too! I’ve been a lucky recipient of this handmade card and it is truly remarkable! Such a wonderful personal touch. LOVE!